The Music Learning Fest is here again this coming August 2019! 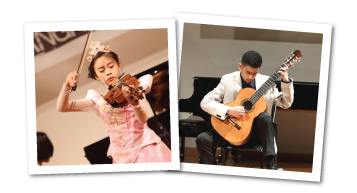 Supported by Trinity College London, this multiple-day event aims to provide young musicians with opportunities to partipate in a variety of music activities. Perform on stage, get professional feedback, gain recognition of achievements, and meet with like-mind music-lovers! 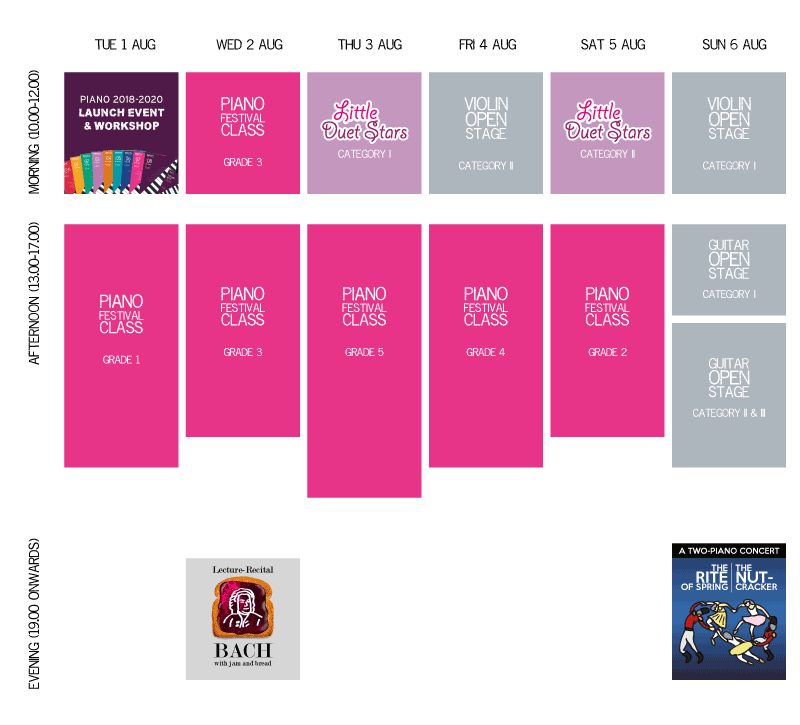 Main events this year include the all-time favourite Piano Festival Class in five categories, from Grade 1 to Grade 5, as well as Young Musicians' Open Stage, which provides an opportunity for young musicians learning different instruments to take to the stage and perform for the public. As always, there are several educational concerts and talks, as well as the Winners' Concert by our winners from the Bangkok Young Pianists' Concerto Competition last year. A music festival is usually simply a gathering of musicians, either professional or amateur, as well as music enthusiasts, to enjoy music together. The scale can range from a small village festival, where local residents bring out their instruments to show off their talents and share their love of music in the town hall, to large scale festivals that include professional artists from all around the world and hundreds of thousands of attendees. However, no matter the size, the spirit is always the same: it is an opportunity to celebrate the joy that is music with others. Our Music Learning Fest is an annual event organized by Eduprogress, with support from Trinity College London, to promote classical music in Thailand. Our main focus is on music education. We aim to provide a stage where young musicians from a variety of skill levels can have a chance to perform in front of a real audience in a professional setting, get feedback from experts, as well as attend other educational activities during the festival week. Piano Festival Class is an activity aimed to provide young pianists below 15 years of age with an opportunity to perform level-appropriate pieces to a public audience. This not only provides a professional setting for their performance, but also helps provide a chance for them to meet, share experiences with and listen to and draw inspiration from other young pianists. The performance also serves to enhance their musical experience and provide a concrete goal for young musicians to strive towards. The participants perform two pieces selected from Grades 1-5 from the Trinity College London Piano Syllabus 2018-2020, along with three technical exercises. The performance is judged as a whole and participants are awarded a gold, silver or bronze medal according to their level of performance, as well as a certificate of participation. The Best in Class trophy is awarded to the performer with the highest marks in each grade category. All activities are open to Thai nationals and foreign nationals with proof of residency in Thailand for no less than 1 year on the date of application. All activities will take place in the first week of August 2019. Participants who are unable to show up for the activities agree to forfeit their application. No refunds will be given. Participants may apply to take part in more than one category in each activity, but will be eligible for only one cash or trophy prize in the highest category. This does not apply to award medals. 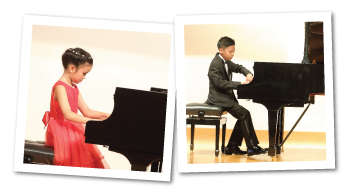 Participants in Young Performers' Open Stage are responsible for their own piano accompanist. Each teacher may only enter up to 5 participants for each category. Performance order is determined by a random draw by the applicant at the time of application. For online applications, the performance order will be assigned randomly by the centre. All music must be performed from memory. Repeats other than D.S. and D.C. al fine are to be omitted, unless specified otherwise in the relevant Trinity College London syllabus with the words ‘repeats are to be played in the examination’. Pieces may be chosen from the alternative lists from the relevant Trinity College London syllabus. A hard copy must be provided to the centre before 31 May 2019. Participants will be provided with details to log-in onto the Music Learning Fest participant information system to add additional personal details and specify their performance pieces. All details must be entered online before 31 May 2019. Failure to comply with any of the stated rules may result in a deduction of marks or disqualification. The adjudicator is a music expert from Trinity College London. Marks are awarded for notational accuracy and fluency, technical facility, and communication and interpretation. A smaller portion of the marks also go to choosing a balanced programme and presentation skills. The adjudicator’s decision is final. For activities where there is a competing element, the adjudicator reserves the right to not name a winner in case there is no suitable candidate. Apply to join the activity! All participants will receive comments from the adjudicator and will be awarded a gold, silver or bronze medal according to their level of performance.